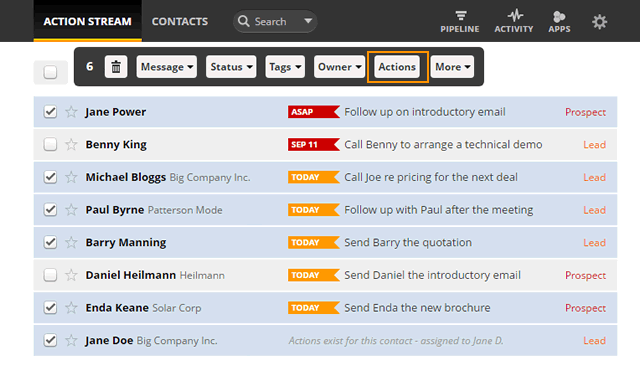 You can easily create, edit or complete Next Actions for multiple contacts using the Bulk Updates bar. Select contacts from your Action Stream. In the Bulk Updates menu, click on Actions. In the Bulk set action pop-up, select Set Next Action. Set Next Action text and date. 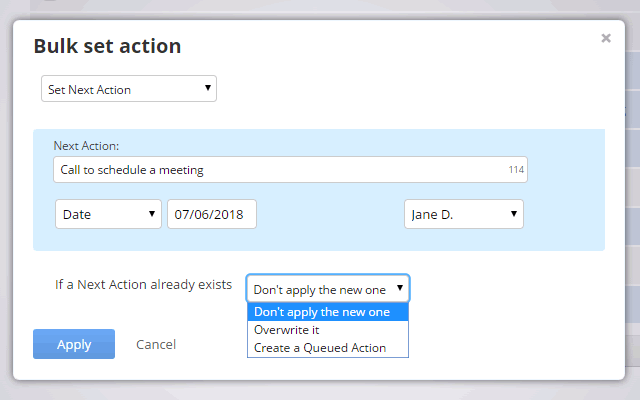 Change Next Action date by selecting a date and leaving the Next Action field blank. Assign an action to another team member by selecting a team member from the User drop-down. Don't apply the new one: new Next Action text and date will not be applied to the contact. Overwrite it: new Next Action details will replace the existing one. Create a Queued Action: the existing Next Action is kept and a Queued Action will be created. Click Apply to confirm changes. In the Bulk set action pop-up, select Mark Next Action complete. Mark all selected contacts' Next Actions assigned to you complete. Close sales cycle for contacts without pending Queued Actions for you by simply ticking the Close sales cycle check-box. In the Bulk set action pop-up, select Delete Queued Actions. The Delete Queued Actions allows you delete queued actions for selected contacts. To delete only actions queued for me, select 'my' from the drop-down. To delete all Queued Actions independent of the assignee, select all from the drop-down. 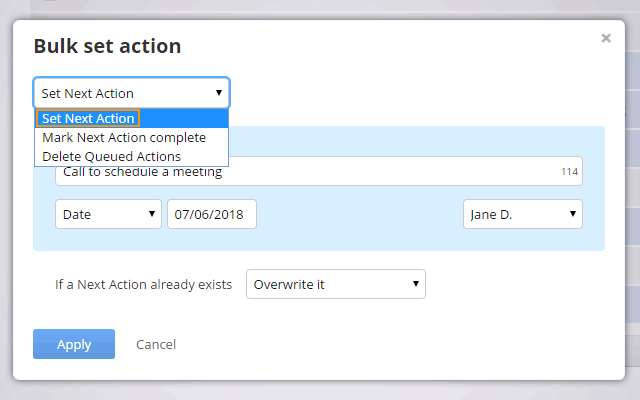 Set Next Action and If a Next Action already exists is set to Create a Queued Action then the Next Action (not Queued Action) will be assigned to the contact. You cannot close sales cycle for a contact with Queued Actions assigned to you. 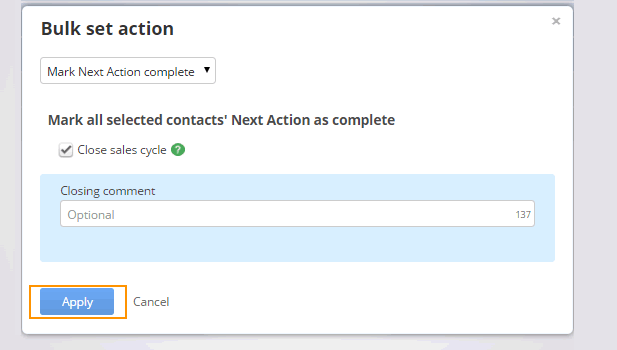 First you will have to delete all Queued Actions assigned to you and then you are allowed to close sales cycle for this contact. Please note that there are some scenarios that the number of contacts updated differs from the number of selected contacts. To learn more about this check out Why some of the contacts selected in bulk are not updated?